The Western Cape could soon become the manufacturing hub of evacuated tube solar water heaters. These devices are the newest form of solar water heaters and are globally becoming the number one choice for those in the market for cost-effective heating alternatives. 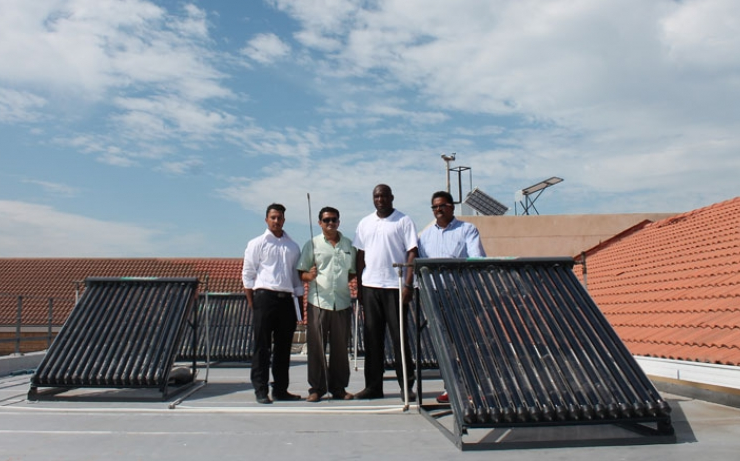 CPUT along with Trihelix International Business Developers in China, which comprises of Trihelix Company Ltd, Himin Solar Co and Shanduka Energy, are collaborating on Project Sunshine, an initiative that could see the development of a solar water heater manufacturing plant in the Western Cape. CPUT has been tasked with research and development of the devices and has already set up a testing facility at the Mechanical Engineering Building that is managed by lecturer Fareed Ismail along with several postgraduate and undergraduate engineering students. “We don’t know how these devices will work in our climate and are currently conducting tests to determine the viability of the evacuated tube solar water heaters in a South African climate,” says Ismail. The devices are made up of a several panels and interlocking tubes that are designed to trap the sun’s radiation and heat water that is pushed through the tubes. The heated water is collected in a low or high pressure geyser. Operational Manager at Trihelix, Cedrick Hendriks, says Project Sunshine holds huge benefits for the local community with up to 300 new job opportunities at the plant as well as a further 4 000 in related sector.